An investor looks up at electronic boards displaying stock information at the ADX Abu Dhabi Securities Exchange stock market. Investing in two stock markets in the same country would not usually be considered a way of diversifying assets, but investors who had stakes in both of the United Arab Emirates’ main equities exchanges last year will have noted that that there was little in the way of correlation between them. The Abu Dhabi market index finished the year 10.7 percent higher but, as the head of research at Menacorp, Issam Kassabieh, pointed out, its performance is swayed largely by its two biggest stocks - First Abu Dhabi Bank and Etisalat, which comprised almost 62 percent of the market's total capitalisation of almost $499 billion at close on January 15. Although the value of Etisalat's stock fell slightly (around 3 percent) last year, First Abu Dhabi Bank was the market's third-best performer - its shares were up 34.9 percent, beaten only by insurance firm Watania (up 37.8 percent) and Abu Dhabi National Energy Co, Taqa, whose shares increased in value by 96.4 percent last year on the back of higher oil prices. Kassabieh told Zawya in a telephone interview last week that “generally speaking, the volumes in Abu Dhabi were extremely low if you factor out First Abu Dhabi Bank and Etisalat”. Total traded volumes for the Abu Dhabi market in 2018 dropped 26 percent to $10 billion, according to data from KAMCO Research. He also said rumours surrounding Abu Dhabi Islamic Bank created movement in its stock, as did an easing of foreign ownership limits for the bank. Kassabieh also argued that although the exchange "is quite behind DFM" in a number of ways, this means changes can be made to market infrastructure which could directly lead to an improved performance for the market. “One of them is the increase in foreign ownership. A lot of the stocks in Abu Dhabi...don’t approve foreign ownership,” he said, arguing that this could be an easy way to attract more interest in its market. Jaap Meijer, head of equity research at Dubai-based Arqaam Capital, said that he anticipates that increases in foreign ownership limits (FOLs) should also increase both foreign buying and trading volumes of a number of Dubai-based stocks. “We hope to see ENBD (Emirates NBD bank) lift its FOL from 5 percent to 20 percent, Du from zero to 20 percent and Aramex from 49 percent to 100 percent,” he said in an emailed response to questions from Zawya. The Dubai Financial Market could do with the lift. Although it is much more diversified than the Abu Dhabi index in terms of the size and strengths of sectors represented, it endured a torrid year in 2018, with the DFM General Index declining in value by 25.8 during the year, according to Eikon data, and traded volumes dropping by 48.2 percent to just $16.1 billion as investors sought more lucrative returns elsewhere in the Gulf. Moreover, the ever-strengthening United States dollar, to which the UAE dirham is pegged, contributed towards a slowdown in tourism markets, where overnight visitor numbers flattened during the first nine months of the year. The sector causing the biggest concern among investors in Dubai was real estate, however, as the pipeline of completed homes grows. 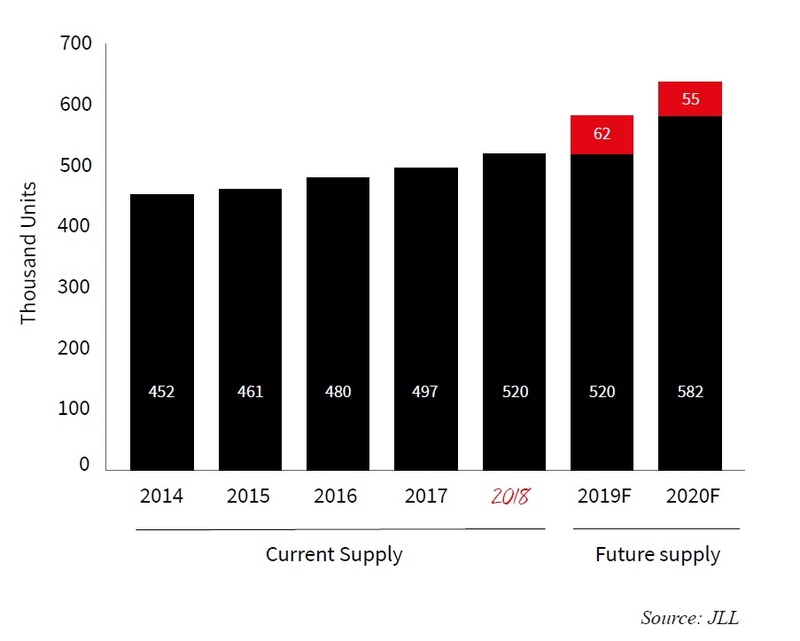 A report published by JLL on Monday showed that 117,000 new homes are scheduled to complete in Dubai over the next two years, which, if they were all delivered, would increase the current stock of 520,000 units by 22 percent, to 637,000 by the end of 2020. Although the amount of homes that will actually be completed is likely to be lower, the impact of so many deliveries on a market where deals remain low (although one in which buying picked up in late 2018) meant Dubai developers' values took a big hit last year. Union Properties’ shares fell 58.7 percent in 2018, Damac Properties dropped by 54.7 percent and flagship Emaar Properties fell 37.5 percent. However, the three worst-performing shares on the DFM last year were Dubai Parks and Resorts’ parent DXB Entertainment (down 63.7 percent), home loans firm Amlak Finance (down 64 percent) and cash-strapped contractor Drake & Scull (down 83.6 percent). Meijer said the availability of ready units in the UAE “will impede off-plan sales, add pressure on prices and squeeze developer margins over the next two years”. He said the sell-off has placed valuations of real estate assets "at near 2009 lows" and could lead to funding gaps occurring for some schemes. As a result, he said Emaar Malls is the only company it rates as a “conviction buy” in the sector. Kassabieh was more upbeat on developers' ability to find buyers, particularly as the yields offered to investors in UAE property remain much more attractive than in mature markets like London or New York, or even other emerging hubs such as Singapore. Kassabieh believes there are opportunities for developers, particularly those who follow UAE diplomatic leads into new, emerging markets to find investors hunting healthy yields, but said that some of the uncertainty surrounding UAE developers was due to their own inability to convince investors of their long-term vision. “They’re not really communicating their strategy at least they’re not giving investors enough details to make the decisions with a full understanding of the big picture,” he said, adding that statements focusing on return on investment and similar metrics may justify performance, but do not clearly explain its focus. Charles-Henry Monchau, head of investment management at Dubai-based Al Mal Capital, said that the sell-off of Dubai equities in 2018 meant the market “trades at a very inexpensive P/E (price-earnings ratio) of 6.5x with a dividend yield of 6.2 percent. On this basis, the Dubai equity index is probably among the cheapest in the world. What is missing is catalysts to unlock value,” he said. He believes that a rebound could be triggered by new government initiatives aimed at boosting the economy, including a new visa regime and offering foreigners the opportunity to own 100 percent of local firms, by increased government spending and by attracting more overseas buyers. Kassabieh sees opportunities for investors in the banking sector, where more consolidation plays are likely, and for the insurance sector, for similar reasons. “I believe M&As are being triggered gradually in the insurance sector, so I think it’s an interesting sector to look at,” he said. He warned, however, that there is likely to be more fall-out this year from the collapse of Dubai-based private equity group Abraaj, as listed companies that either invested in Abraaj funds or gave loans to the company will be required by auditors to make provisions for potential losses when preparing full-year accounts. Click on the links below to see how other Gulf markets fared.